Nice Ride is coming to town!! First glimpse of the Nice Ride bike to be deployed here in Bemidji! I love the colors! 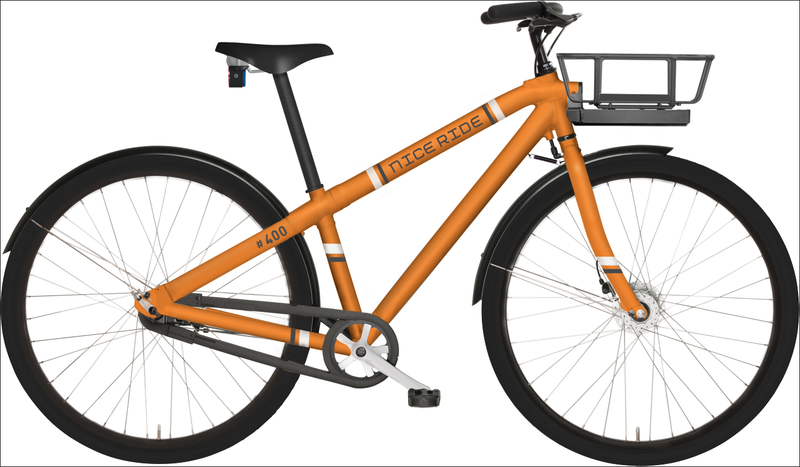 Nice Ride bikes are coming to town! You’ll ride them to your workplace. If you can’t get there by dark. Yes, folks, Nice Ride MN is bringing bike share to Bemidji Minnesota! This spring a fleet of 100 specially designed bikes will be deployed in our Fair City for use by commuters and tourists, shoppers, and those of us who just want to enjoy a little exercise and fresh air in our beautiful town. The program will feature low rental rates for locals, convenient locations, and multiple drop of sites. The bikes are awesome. These 3 speed beauties are equipped with lights, a bell, and a rugged basket that can handle a whole bag of groceries. The chain is fully enclosed to minimize maintenance and prevent those black “chain kisses” on your ankle. Seat is fully adjustable. If you want a sneak preview of the bike come out for The Night We Light on Friday November 29th (see the home page for details). We will have a prototype bike on display (it will be in the parade). It will be available for test rides after the parade and other times during the holiday season. Santa knows that when it comes to bikes Bemidji is never naughty, and always NICE!